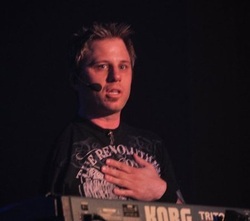 Todd Waites is a 2 time cancer survivor, arm amputee, keyboardist and motivational speaker. He has toured all over the country and other parts of the world as a keyboardist/backing vocalist, most recently for 3 years with the ApologetiX... an internationally known touring/recording Christian parody band. 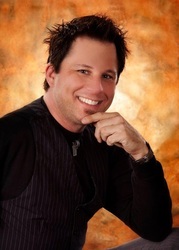 Todd appears on multiple CD's, a live DVD, and has played all over the country sometimes in the upwards of 100 shows per year. Playing the keyboards since age 4, Todd’s dream of being a “rockstar” seemed shattered when he lost his arm and shoulder at 14 years due to an aggressive bone cancer. While undergoing a rigorous 18 months of chemotherapy, Todd kept his mind off of the treatments by pouring himself into the keyboards and re-learning how to play with just one hand. His dedication to overcoming adversity paid off as he has since been featured in national magazines, "coached" David Bryan (the keyboardist of the hugely successful band Bon Jovi) when he lost the tip of his finger, and has gained the attention and respect from many people worldwide. Todd has been interviewed and featured by many media outlets, and is a major focus in a best-selling motivational book published in 2013. In 2014 he was asked to be the touring keyboardist for a former singer for the band Journey who is now a Christian. Soon after accepting the offer Todd was diagnosed again with cancer, this time in his thyroid and had to take a break from traveling. After leaving the Apologetix to accommodate the demand for speaking events, he now shares his story of finding his purpose in Christ through adversity at speaking events (with keyboard in tow) all over the world. His story of hope, overcoming obstacles, and being "whole as is" touches young and old alike and is a reminder that God has a plan and a purpose for everyone...and that God’s plan is better than the one we have for ourselves. Todd speaks at many churches/events and is a great message for all ages. He brings a keyboard and shares the story of when he was young and taking lessons...not understanding why he had to learn notes, scales, etc. while at the same time not understanding why he had to learn certain parts of the Bible. He demonstrates the progression of re-learning to play with one hand and how the things he learned as a kid helped him to achieve that. The same applies to learning God's word and that as time goes on…the things which may not make sense will all matter someday. He then talks about finding his purpose in Christ, and how God has a plan for every single person. He incorporates humor, inspiration, and is relevant to all ages. Todd can accompany your worship team if desired, and can do multiple speaking engagements in the same day/weekend. Todd Waites recorded an instrumental version of What Child Is This using his Korg keyboards. He was blessed to have John Lawry of Petra produce this recording. Todd also speaks to thousands of K-12 students, faculty and staff at many secular/public schools. Todd is extremely grateful and honored to be chosen as an endorser of the best and most popular keyboard manufacturer in the world...Korg. Todd writes: "One of my very first keyboards was a Korg Poly-6 which was way ahead of it's time even back then. At various times over the years I have owned Korg keyboard models DW-8000, DSS-1, Triton Pro X, Triton Extreme, and now the Kronos which is easily the coolest keyboard ever made. It just proves again that Korg continues to raise the bar and set the standard. Thanks Korg, keep up the great work!" Click HERE for more info.